ROME (AP) — Italy's recently discovered prehistoric couple will continue their 5,000-year-old embrace undisturbed through Valentine's Day and beyond. The two skeletons unearthed last week locked in a deep hug will be scooped out of the earth in one piece to undergo tests before going on display in the northern Italian city of Mantua, archaeologists said Tuesday. The pair, buried between 5,000 and 6,000 years ago in the late Neolithic period, are believed to be a man and a woman and are thought to have died young, because their teeth were found intact. 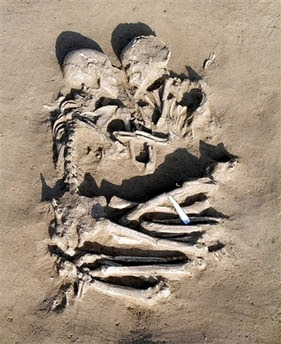 Archaeologists have hailed the find, saying that double burials from that period are rare and none have been found in such a touching pose. The burial was unearthed on the outskirts of Mantua during construction work. The site is located just 25 miles south of Verona, the city where Shakespeare set the story of ``Romeo and Juliet'' and the discovery fueled musings in the media about prehistoric love.